My son (from a small town North of Pittsburgh who has been a Steeler/Pirates/Penguins fan for almost 50 years) was thrilled with the map. He is going to put it into his revamped office at work. He still drives from Cleveland to Pittsburgh for the Steeler home games and he knows the area like the back of his hand. Thanks for having such a unique gift available! 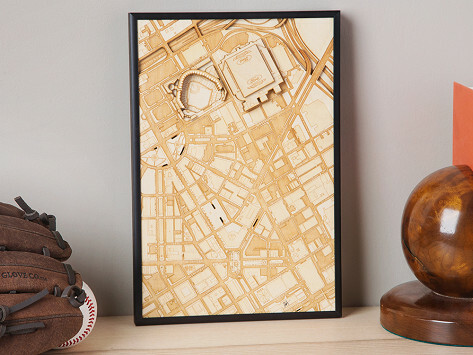 I bought the Stadium Map Art of Detroit for my husband's birthday. He loved it! We relived our past trips to Comerica Park Tiger's stadium and walks in Detroit. It has beautiful detail and great craft in the creation. We love our 3D print! I love that it combined our favorite city with (my husband’s) passion for sports. It is proudly displaying on our kitchen wall for all to see! Purchased it for my husbands birthday - which is in October. I think it’s awesome and I’m sure he’ll feel the same way when he gets it. This was the perfect gift for my husband!! He is a HUGE Green Bay fan, this was the perfect addition to our Packer Wall. We have a Bart Star's framed autograph for my Sweetie on our 11th anniversary (10 years ago), his stock in the Green Bay Packers Certificate and now this beautiful lazier etched satellite view of Lambeau Field makes this PERFECT!!! I wish I could attach a picture. :) He loves this and this was another way for me to show him how much I love and appreciate him everyday! Thank you Stadium Map Art!! Cleveland, Ohio is where the sun always shines." I ordered Cleveland's city stadium map for myself a couple months ago and I am very impressed with "the detail" of the map. The precision is unremarkable. I have had many compliments from my friends and family. Well worth the money spent if you are a fan of your city and team. The detail is absolutely incredible! It even is the street names. My brother-in-law was totally amazed!